St. Mary’s Church in Lutterworth is now more than 800 years old and remains an active congregation. Visitors to that church will have the opportunity to see many artifacts related to the life and ministry of John Wycliffe, none of them more noteworthy than the pulpit. 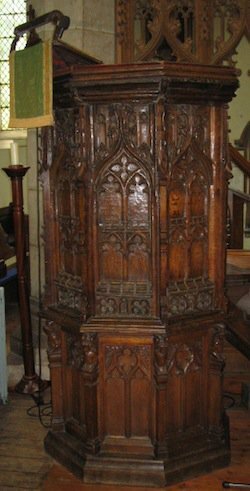 Wycliffe’s pulpit is the eighth of the twenty-five objects through which we are tracing the history of Christianity. It was through this pulpit that Wycliffe would preach the Word of God and defy the corrupt doctrine of the Roman Catholic Church. 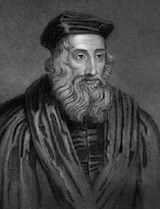 John Wycliffe was born in a small village in Yorkshire, England in 1330. These were the late Middle Ages, still two hundred years before the Reformation. English was in its infancy, slowly developing into the language of the common people. Whether a man was born high or low, whether he was a peasant or a ruler, the Church would dominate his life; yet the Church was increasingly corrupt and had become a political force as much as a religious body. Wycliffe attended Oxford University, receiving his Bachelor of Divinity in 1369 and his doctorate in 1372. Gifted with a brilliant mind, he was soon recognized as one of the world’s foremost theologians and philosophers. In 1374 he was appointed rector of Lutterworth and he remained in that position until his death ten years later. It was as a scholar that he first came afoul of the Church, for he backed the government’s right to seize the property of corrupt clergy, elevating civil authority over ecclesiastical authority. Over time his growing understanding of Scripture and Christian doctrine coalesced into three critiques of the Roman Catholic Church. These critiques were related to the church, the Eucharist, and the Scriptures. As he studied the Bible Wycliffe came to understand that Christ’s church was composed of the “congregation of the predestined” and that Christ was the church’s only head. He rejected papal authority and indulgences and instead emphasized the Christian’s need for holiness and the necessity of a direct relationship with God through Jesus Christ. He also saw the necessity of purifying the Eucharist from idolatry and superstition. For this reason he battled against transubstantiation, insisting that the bread and wine do not actually become the body and blood of Christ, but that Christ is spiritually, not physically, present in the Eucharist. Transubstantiation was by now a dogma of the Roman Church and his opposition to this doctrine marked him as a heretic. Further, Wycliffe believed that every Christian had the right to know the Bible and insisted that the Christian did not require a priest to serve as a mediator between him and God. He believed that the Christian was justified by faith in Christ alone and that justification did not depend upon pilgrimages, good works, and participation in the Mass. His most enduring legacy would be a logical outcome of what he believed about Scripture. At this time to speak of “the Bible” was to speak of the Latin Vulgate. Latin was now the language of only the religious elite; only the smallest fragments of Scripture were available in the common tongue. If Christians were to know the Bible and if the Bible was to be set free to accomplish its work, the people would need to have access to it in their own language. For this reason Wycliffe began to translate the Bible from the Vulgate into English, translating much of the New Testament himself while relying on others to complete the Old. In 1382, shortly before his death, he witnessed the completion of the first full translation of the Bible into the English language. This would be revised by his followers shortly after his death. These Bibles were painstakingly copied by hand with each copy taking months to complete. Once copied they were carried throughout the land by men known as “Lollards” who simply read the Bible and preached the gospel. 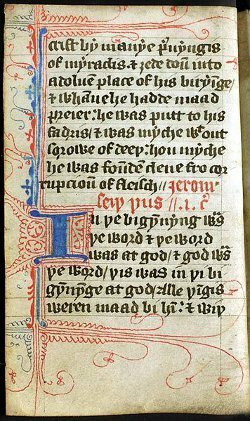 Before long the Church deemed Wycliffe’s Bible so dangerous that to read it was punishable by death. Though English has evolved a great deal since 1382, the language remains recognizable and the translation remarkably accurate. Much of Wycliffe’s work was completed at Lutterworth. His pulpit remains within the church. Though it has been repaired and added to over the years, it remains substantially the same as it was when Wycliffe stood within it and preached the gospel of grace. It is a physical link with John Wycliffe and the other pre-Reformers. Slowly, but undeniably, the stage was being set for an upheaval, a Reformation. But before we can turn to the Reformation, we must look to at least two more important artifacts.